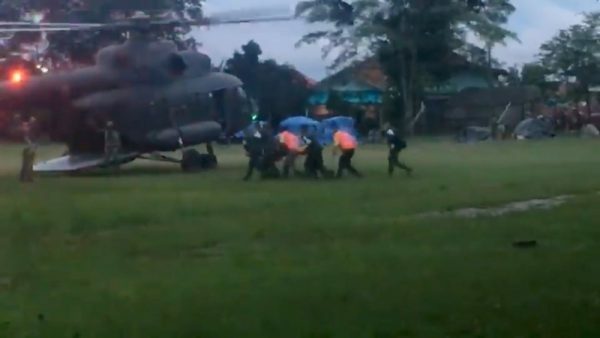 CHIANG RAI, Thailand—A mission to rescue a group of boys and their soccer coach trapped in a flooded cave in Thailand resumed on Monday, the chief of the mission said, after the first four boys rescued were judged healthy as they recovered in hospital. The dangerous bid to rescue the boys—aged between 11 and 16—got going again after a break from late on Sunday to replenish oxygen supplies and make other preparations deep inside the cave complex in northern Thailand’s Chiang Rai province. 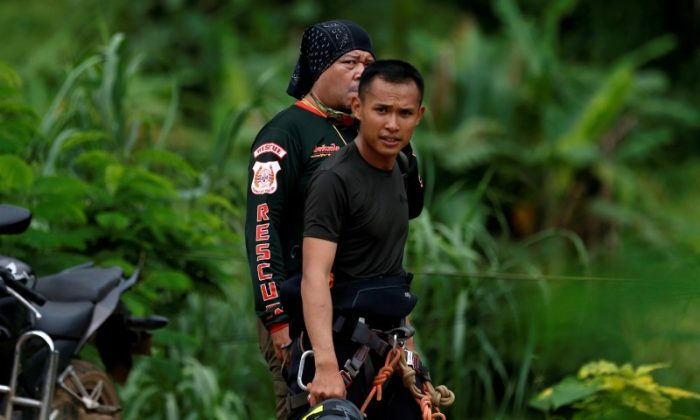 “We have sent the team in at around 11 a.m. Hopefully we will have good news in a few hours,” the head of the rescue mission, Narongsak Osottanakorn, told a news conference. The “Wild Boars” soccer team and their coach set out to explore the vast Tham Luang cave complex after soccer practice on June 23, and got trapped when a rainy season downpour flooded the tunnels. Then the problem became how to get them out as more rainy season showers loomed. The rescue began on Sunday. Divers held the first four boys close to bring them out, and each had to wear an oxygen mask to enable normal breathing, authorities said. Interior Minister Anupong Paochinda told reporters the rescued boys were in good health in hospital but did not give details. Narongsak said the rescued boys had not been identified out of respect for the families whose sons were still trapped, adding that the boys were being kept away from their parents due to fear of infection. Medical teams previously said concerns included hypothermia and an airborne lung infection known as “cave disease,” which is caused by bat and bird droppings. “I’m hoping for good news today,” he said. At least nine ambulances loaded with stretchers and blue oxygen tanks waited by the mouth of the cave on Monday. Soldiers, medics, engineers, and volunteers in yellow shirts milled around but the mood was relaxed. The president of soccer’s governing body, FIFA, has invited the boys to the World Cup final in Moscow on Sunday if they make it out in time.